The stormy weather threatened but ultimately held back at the Frank Horky Spring Camporee this past weekend. The Camporee is an annual event for the Saugahatchee District, which has been held at Chewacla State Park for the last several years. 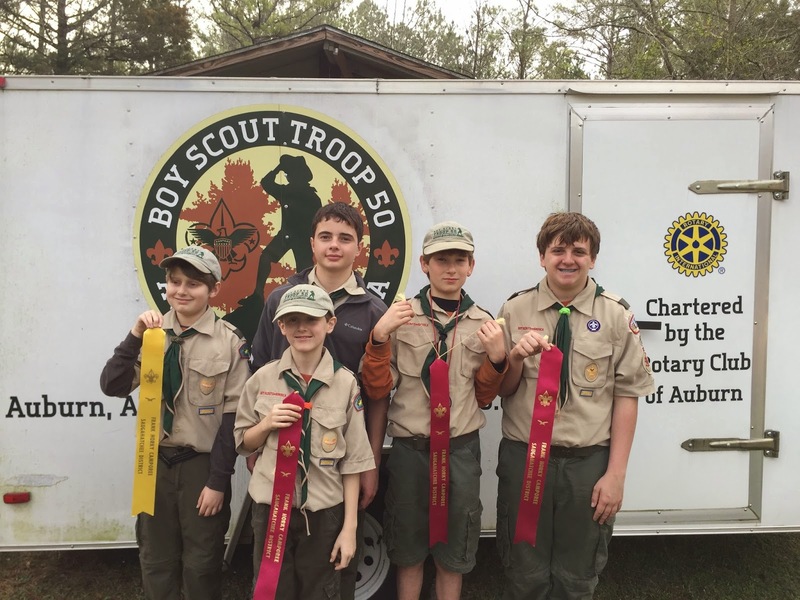 Camporee events included patrol competitions, a service project, and an emergency drill that served to satisfy several requirements for the Emergency Preparedness merit badge. 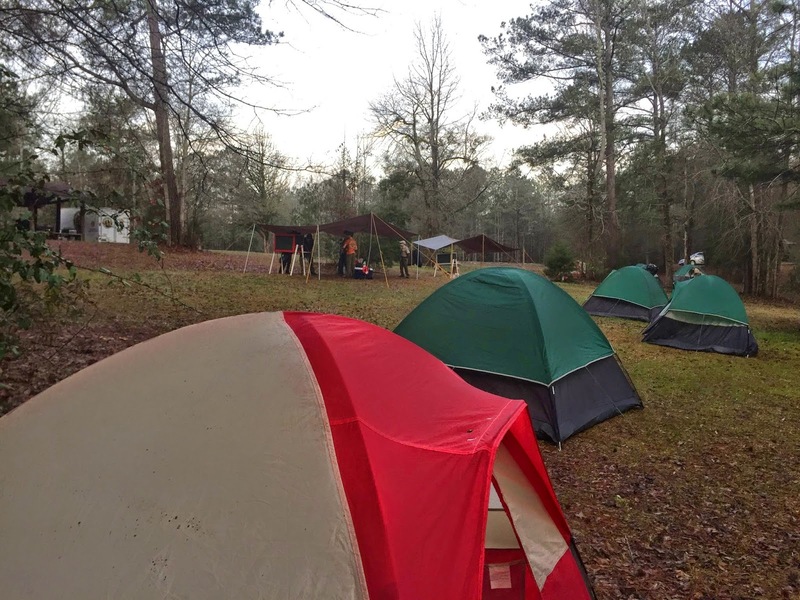 Troop 50 camped with a total of nineteen Scouts and six adult leaders, including two Webelos who are preparing to join the troop in April. The Troop 50 campsite at the CCC Campground at Chewacla. The patrol competitions took place on Friday evening and pitted seven patrols from four different troops against each other in a test of Scout skills and teamwork exercises called the Mafeking Exercise. The program is based on the story of the Siege of Mafeking during the Boer War in Africa. The British Army commander of Mafeking was Robert Baden-Powell who would later found the Scouting movement. The competition involved seven events which took place in the dark, starting at 10:00 pm and ending after midnight. Some of the events required the Scouts to use their scout skills to complete a task. The "Man Down!" event had the patrols treat an injured victim then build a stretcher to transport him a certain distance. The "Abandoned Fort" involved measuring the height and width of a water tower at the campground and "River Crossing" had the Scouts measure the distance across a stream that they could not cross. Other events challenged Scouts to work as a team. The "Electric Fence" event required each patrol to get all members of the patrol over a simulated electrified line using only a 2x6 piece of wood for assistance. "Enemy Spies" challenged the patrols to cross an open field, crisscrossed by searchlights, without being spotted. Other events included "Signal for Help," which required Scouts to send a message in Morse Code, and a memory test called "Observation Post." The Outdoorsmen and the Carnivorous Pandas of Troop 50 worked their way through each event despite the misting rain that fell during the evening. On Saturday, the threat of rain passed completely and the Scouts took to the woods for a service project in the morning. All of the troops worked their way down the banks of Town Creek to Chewacla Creek and up towards the connection with Moores Mill Creek picking up trash along the way. In the afternoon, Scouts participated in a simulated emergency, complete with moulaged victims. The drill met several requirements for the Eagle-required Emergency Preparedness merit badge. The evening's awards campfire was much anticipated but the campfire itself refused to cooperate, possibly due to wet wood from the rain of the previous few days. The awards for each event were handed out nevertheless. The Outdoorsmen received a third place ribbon for the "Observation Post" and the Carnivorous Pandas received four ribbons. Their take included third place in the "River Crossing" event and three, second place ribbons for "Electric Fence," "Signal for Help," and "Man Down." 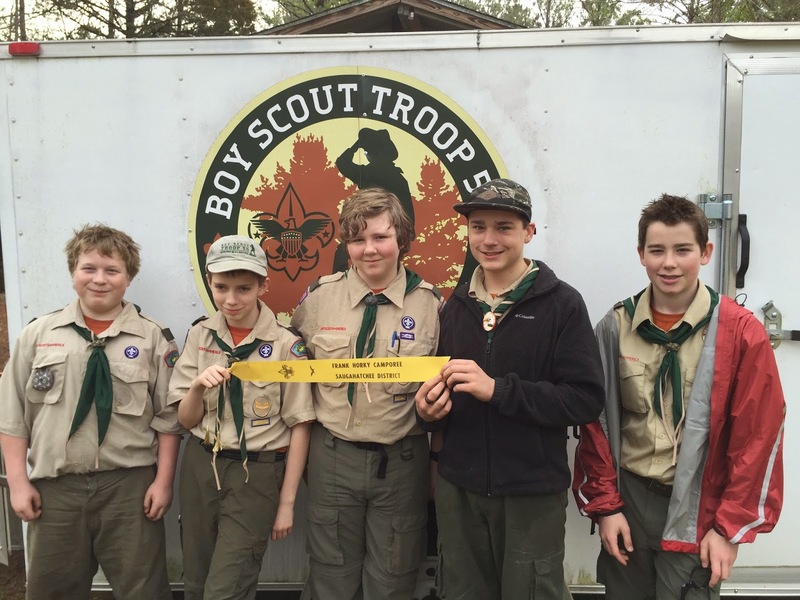 Despite the hard work of our patrols, the overall winner for the camporee was a patrol from Troop 371. The Outdoorsmen display their ribbon on Sunday morning. (L to R) Jason, Ethan, Nicky, Patrol Leader Josh, and Clay. Absent from the photo are Liam, Rusty, and Assistant Patrol Leader Creighton. The Carnivorous Pandas show off their awards. (L to R) Assistant Patrol Leader Everett, Aiden, Patrol Leader Louie, Joey, and Troop Guide Michael. Absent from the photo are Kyle, Joe, and Webelos Scouts Trey and Carl. At the PLC on Monday evening, the troop's youth leadership was happy overall with the campout and noted that both patrols were recognized for their teamwork in the challenging events. They welcomed the fact that an emergency drill was part of the program on Saturday. The requirements for Emergency Preparedness merit badge are some of the most difficult to complete outside of an event such as this. The PLC also noted that there were areas in which we could still improve. There was damage to a tent and a dining fly pole that must be avoided in the future. Although cooking skills and menu planning have improved, there is still work to be done in training younger scouts in the proper procedures needed for cooking and cleaning. The PLC also made plans for the upcoming meetings and the annual planning conference campout in May. The few photos that made it past the rain are found in the online photo gallery.